ZIMBABWE – Former Vice-President Joice Mujuru has reportedly met opposition People’s Democratic Party (PDP) leader Tendai Biti and MDC-T treasurer-general Theresa Makone over the past two weeks, as she intensifies efforts to form a grand coalition of opposition parties to challenge President Robert Mugabe’s stranglehold on power in the 2018 elections, NewsDay has learnt. Impeccable sources told NewsDay that following the conclusion of her whirlwind tour of the country’s provinces, Mujuru was now holding boardroom discussions with representatives of various political parties to find common ground. This is despite the fact that Mujuru has not yet transformed her People First (PF) project into a political party, resulting in other opposition parties discounting her as a political force to reckon with. 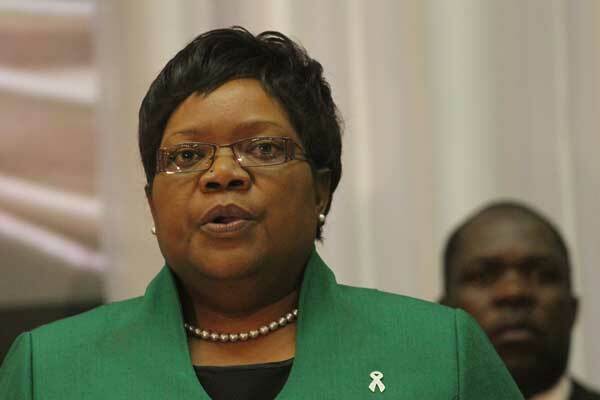 “Two weeks ago, Mujuru met MDC-T’s Theresa Makone at her home in Harare, where they discussed the country’s political environment and they sounded each other out on the possibility of a coalition between their two parties,” the source said. The sources added, parties to the negotiations had agreed to keep the matter under wraps to avoid jeopardising the discussions and giving Zanu PF adequate ammunition to crush them. PF spokesperson Rugare Gumbo was coy on the matter when contacted for comment yesterday. “I cannot confirm or deny such meetings took place,” Gumbo said. PDP spokesperson Jacob Mafume, however, denied reports Biti had met Mujuru. “He has not met Mujuru, not as far as I am aware, but he has consistently met with leading PF figures such as Rugare Gumbo, [Didymus] Mutasa, [Kudakwashe] Bhasikiti and many others in his capacity as their lawyer,” he said. Biti could not be reached for comment. MDC-T spokesperson Obert Gutu referred questions relating to the meeting to party leader Morgan Tsvangirai’s office. “I speak on behalf of the party. Our leader, Morgan Tsvangirai, has got his official spokesperson, Luke Tamborinyoka,” Gutu said. Tamborinyoka confirmed Tsvangirai was handling “all issues to do with coalitions”, but played down reports Makone had met Mujuru. Another source, however, claimed, Mujuru was also trying to meet Renewal Democrats of Zimbabwe leader Elton Mangoma. Mangoma has made it clear that he does not fathom a coalition with Mujuru “because she was part of the system that denied Zimbabweans their freedoms and abated it for decades”. “Mangoma has indicated he is not willing to meet with Mujuru as long as Mutasa is part of such a meeting. It seems Mujuru has relented and although a date is yet to be set, the two will definitely meet soon,” the source said. But Mangoma denied having an appointment with Mujuru. “I am hearing it from you for the first time. Maybe they will come,” he said. Since the turn of the year, Mujuru has upped the ante, meeting structures across the country, a move that has rattled not only Zanu PF, but the opposition, amid reports of some of their structures jumping ship to join the former Vice-President’s yet-to-be formed political outfit. Mujuru was pushed out of Zanu PF in brutal fashion ahead of the ruling party’s 2014 congress on allegations she was behind a plot to remove Mugabe by foul means.